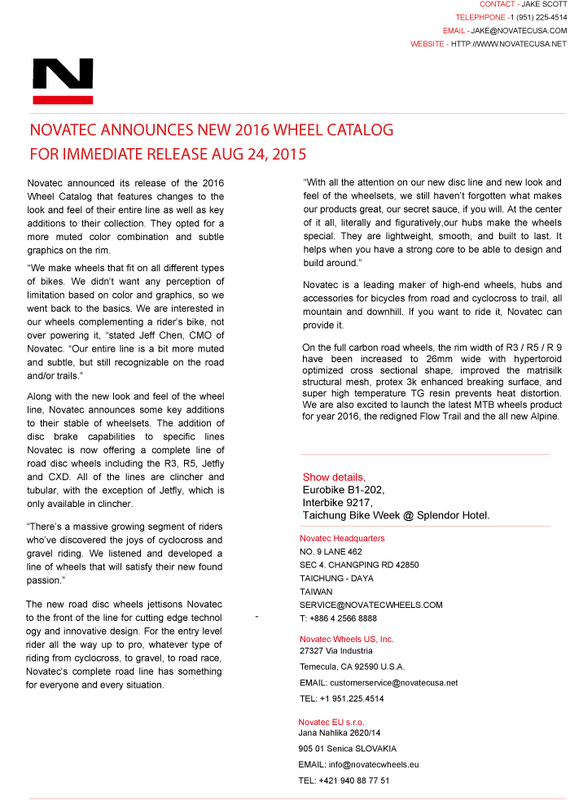 Novatec announced its release of the 2016 Wheel Catalog that features changes to the look and feel of their entire line as well as key additions to their collection. They opted for a more muted color combination and subtle graphics on the rim. Along with the new look and feel of the wheel line, Novatec announces some key additions to their stable of wheelsets. The addition of disc brake capabilities to specific lines Novatec is now offering a complete line of road disc wheels including the R3, R5, Jetfly and CXD. All of the lines are clincher and tubular, with the exception of Jetfly, which is only available in clincher. The new road disc wheels jettisons Novatec to the front of the line for cutting edge technology and innovative design. For the entry level rider all the way up to pro, whatever type of riding from cyclocross, to gravel, to road race, Novatec’s complete road line has something for everyone and every situation. Novatec is a leading maker of high-end wheels, hubs and accessories for bicycles from road and cyclocross to trail, all mountain and downhill. If you want to ride it, Novatec can provide it. On the full carbon road wheels, the rim width of R3 / R5 / R 9 have been increased to 26mm wide with hypertoroid optimized cross sectional shape, improved the matrisilk structural mesh, protex 3k enhanced breaking surface, and super high temperature TG resin prevents heat distortion. We are also excited to launch the latest MTB wheels product for year 2016, the redigned Flow Trail and the all new Alpine. Taichung Bike Week @ Splendor Hotel. 27327 Via Industria Temecula, CA 92590 U.S.A.